I am updating this post after lots of experience camping. The original focus was more on MCS (which is still in the post), but I am adding more unusual camping equipment and techniques for avoiding mould, updating new gear I really like, and some new tricks. I recommend all the products in this post most of which I have used or are recommended by other sensitive folks. This post contains affiliate links wherever the brands I like have an affiliate program. For my first tent I bought a used tent off Amazon. It turned out to be a new/returned tent so it was perfect for me. I bought Ohuhu pop up tent. I went for the cheapo option here just to get started quick. I used it after one week (with the doors all open at first for air) but it was about 1 month before I found it offgassed and could close up the doors. I was super sensitive at that time. There are a few other better quality brands in this style which are super easy and quick to put up and have a great design in terms of the amount of ventilation. Lightspeed and Coleman have this style and are recommended by sensitive folks. Mine leaked in a heavy rain so I don't like this style of tent, other than the fact that it is very easy to pop up and if you get a good tarp over it you will be waterproof. Anyone super challenged with putting up tents might want to start here. Start with Lightspeed for the super sensitive. 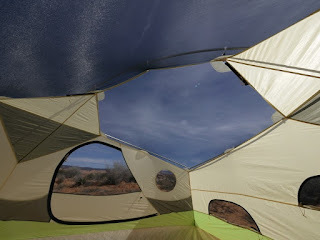 For a heavy rain, a tent with a really good fly is needed (that comes down almost all the way to the ground) like many of the REI or MEC brands or this one or this one. Sometimes the rain fly smells stronger than the tent and sometimes it smells less. Sometimes a super beefy tent bottom is the hardest part to offgas. It depends on the brand. I have used many tents in this second style. You might also need a tarp. Water that soaks the tent walls will then soak anything that is touching the walls. The rainfly also has to be big enough so you can get in and out when it's raining if you don't have a tarp over. For stealth camping on patios and balconies of hotels or Airbnb I have used one person tents. I have tried just a mat with a mosquito net, and I have also just strung up the rain fly over a camping cot and Thermarest. Otherwise you can cut out the bottom. Never put a tent with a bottom right over outdoor, tiles, bricks or concrete, you will have a recipe for mould fast. Some MCSers wash the tents to remove some of the smell but this also removes some of the waterproof coating, so I decided not to try that. More mesh makes it easier to tolerate a tent sooner and prevents condensation. I like putting tents in the sun to offgas them. Smell them to test, and also touch them to make sure they don't cause a burning sensation. Make sure you know how (and that you can) put up your tent alone (as well as set up other supplies like a stove) before you get to the campsite. I have shown up to campsites with tents that are defective or missing parts so I would check for that reason as well. I bought a tarp for underneath to keep dew from getting the tent wet from below, and a tarp for over the tent for heavy rains. The bottom of my tent stayed nice and dry. I would take out and turn over the sleeping mat every day. If the bottom of the tent gets wet you will want to dry it in the sun within 24 hours. You can use the footprints made for underneath tents but tarps are generally cheaper (your tent may come with a footprint). You want the tarp underneath to be a little smaller and tucked in so that is is under the tent. No water should get between the two. Some people tuck it and then raise it a little with sticks or rocks so that no water gets in between. I found regular tarps from the hardware store has a strong smell but offgassed within a few days. A silnylon tarp is more tolerable but is more expensive. This is my preffered tarp for overhead. Some people find they still do have to move the tent every couple of days due to condensation or the earth going funky underneath. Keep a backup tent that is offgassed in case of mould or damage to your primary tent. Keep backup gear especially if you are out in the wilderness, need things to offgas before using, or cannot easily drive somewhere and buy new gear within one day. Generally you string up the tarp up in an A shape so that it's touching neither the tent nor the ground. Some people dig a small trench around so that the water that drips off does not go towards the tent. Without a tarp I had a lot of problems including saturation of the tent and water coming through especially where anything was touching the tent. Digging a trench won't do much in a big storm or in very swampy land, in that case you need to raise it off the ground. After throwing out tent after and tent and then moving on to cutting out the bottoms, I have finally found what seems like the perfect tent for me, an integrated camping cot tent (pictured left). This is off the ground so the bottom will not mould. It will be cooler when you are off the ground like that. But I don't find it any worse than cutting out a bottom and using a camping cot (in fact I find it warmer than tents with the bottom cut out). Ozark is a very tolerable brand for MCS. Brands that MCSers have done well with are Moonlight (no FR, which is rare. Coated with silicone on the outside and polyurethane (PU) on the inside), Lightspeed (polyesters with PU coating) and REI Basecamp (polyester, rainfly and floor coated with PU), the most sensitive should try one of those three brands with some of the most sensitive people I know using REI. LL Bean (polyester with PU from what I have seen) and Big Agnes (nylon, polyester with PU and some silicone) have been tolerable for some. The jury is out on Coleman, some people tolerate it and others don’t. Some people find cheap Walmart tents especially Ozark brand are more tolerable than ones for hundreds of dollars. I have found Ozark tents to be very tolerable myself. The Sierra Tensegrity is FR free and uses silicone and nylon with no polyurethane which may be better for some. Gear Aid silnet is a silicone seam sealer, and some footprints are coated with silicone. For those doing extreme mould avoidance or living somewhere very damp you might want to go with the more disposable option. Expensive tents from REI and MEC tend to pack smaller and lighter and should be higher quality, however, if they do go mouldy it is a bigger loss. If I am travelling with a tent I want one that's not going to break unexpectedly as many places around the world do not have stores that sell tents. Check also how much wind and rain they say they can withstand. But all of that said I would never spend more than 150 on a tent unless I'm sure it's going to last me a long time (like the ones raised off the ground). The tree tents look interesting but you have to keep in mind these are really just for sleeping as they don't look very conducive to hanging out all day, I wonder how much they sag in the middle, and they are not as easy to put up. For those who are less picky about their sleeping environment resembling a regular bed, the hammocks with nets are interesting options that are affordable and easy to travel with. While I would never want to go with anything other than the raised off the ground tent again, this won't work when I travel. When I travel I need to fit a tent, sleeping mat, and sleeping bag into a duffle bag. The sleeping mats I use are huge and unless I can send a tent ahead I would have to go back to cutting out the bottom. I would use plastic bags to encase things instead of the thick tarps I mention below. These tents are insulated and the foil on the inside will also block most of the VOCs from the fabric on the outside. They say you can sleep in them down to 0 degrees Celsius. They are 269 USD. They do not have any mesh for ventilation which I imagine would be quite the problem for condensation and I do not know how you would get fresh air. This doesn't seem realistic at all. For 18 USD you can get this aluminum lined small sleeping tent (that might work for balcony sleeping or in an emergency, otherwise it's barely a tent). The aluminum on the inside is more tolerable than the usual plastic. Others have made homemade tents with materials they can tolerate like Tyvek, Reflectix or XPS sheets. More info on that here. Some folks who cannot handle the synthetic tents have tried canvas tents. These do not hold up well to rain and high humidity and I would not use them in rainy or humid conditions nor expect them to last very long at all. Some companies people like are Reliable Tent and Kodiak Tents. In my experience canvas tents go mouldy quickly. I started with the Lightspeed air mattress which is the one all the MCSers use. It offgassed quickly (2 days in the sun) and felt comfortable. It's good quality but I had back problems with it. I ended up buying the thickest Thermarest instead and LOVING it. This is as comfortable as a bed to me, though many people put Thermarests over a camping cot, that seemed excessive with the Mondo (though cots can also help you get off the ground which is a benefit when you have cut out the bottom). I’m not that picky about beds so I was surprised that the airbed hurt. The Thermarest has a decent R-value to keep you warm, the more insulation you have under you in the cold the better. The MondoKing is very comfortable and I usually wake up forgetting I’m in a tent. It has polyurethane in it but it offgassed quickly in my opinion. I used it after 2 days of airing out (not ideal), in one week I found it to be really good, and one month to be near odourless to me. This is a super good mat for a trailer or other tiny home as well. I bought the repair kit for it as well because this is going to be my main bed in the trailer. When it was hot and sunny (and I was not self-contaminating) I had no problems with condensation if I turned it every couple days and some days left it standing up to air out. As it got cold and I moved it into a trailer it became very challenging to keep this dry and mould free. It needs to have slats underneath and a waterproof cover without a doubt in a cold or damp environment. I wouldn't recommend leaving this on a flat surface without a waterproof cover. You will want to flip or air out your sleeping bag in the day too to prevent mould - if you are extremely sensitive you need to encase it. If you are very sensitive to mould or very unmasked encase the sleeping mat right away. You can use plastic but I prefer these thick aluminised tarps as they also block the smell. I used these tarps and they are a lifesaver. For the ultra sensitive to chemicals, an aluminized Thermarest is the safest camping mat. People usually go with the solid foam or the small inflatable ones as they pack much smaller than the delux one I bought and are more affordable. Here is a good overview of the closed cell foam pads. I still prefer the Mondo King, but another good and more affordable (but thinner option) I use is the Lightspeed version. Other very sensitive folks have tolerated the small air mats. I was very impressed with how little this one smelled (less than the air mattress), and it's a WAY better option to travel with, but I did not find it anywhere near as comfortable as my Mondo Thermarest (I couldn't sleep on it at all). I like this style of camping cot the best which is also small enough to travel with. None of the Thermarests have flame retardants. I'm extremely pleased with this sleeping bag which is warm and offgassed after sitting in the sun for a week or so. I never even washed it. I used this in the summer and some days it was too warm. I am currently using this bag as when it's on sale it's a better price. I use these polyester sheets. But there are specific sheets for Thermarests and other brands of sleeping mats. They are also polyester. You don’t want any cotton in your tent it doesn’t do well outside for long if it's humid. I bought a polyester camping pillow which is small (and it has cotton on the outside!) I use waterproof pillow cases to prevent mould which I aired out and washed before using. They do smell at first but polyurethane coating does offgas to many people's standards. I have tried lots of camping pillows from the air and foam ones to the polyester ones, to just using a towel. You have to figure out which is the most comfortable for you. Some are very small. The air ones can be easy to roll off of. A towel is easy to wash if doing extreme avoidance. Others like a silk sleeping bag liner which keeps you warm and keeps your sleeping bag cleaner. It is much easier to wash a liner than the sleeping bag. I'm using this one and it's quick to dry (surprised by how chemically it smelled, needed more washes than most fabrics). You can also make a liner by sewing a queen flat sheet in half. You can either use a liner to get inside of first or to encase a blanket. This will keep the sleeping bag good for longer. I keep backups of everything. I use a heating blanket in almost every climate. I thought the biggest problem for me would be stabalising my temperature but that ended up not being that difficult at all. This is the heating blanket I use. After going through a lot of these, the trick is I want one big enough to cover me and I want the 10 hour shut off not the 3 hour shut off to keep me warm all night. They are challenging in how strong they smell when new and since they can't go in a dryer they can be difficult to clean in cold weather camping. I encase my current one in these liners and wash the liner every 3 days. For those concerned about EMFs you can use this to heat the tent without putting in on your body. It won’t be as warm but it is likely safer than a stand-alone heater in a tent. Or, the fancier and supposedly healthier option is an infared mat. This 60 watt heated blanket (the smaller type) will run for most of the night off this solar kit. I always have an extension cord running to my tent. But if you don't, hot water bottles can be put inside the sleeping bag at night. This one has been reported to be very tolerable. When you don't have electricity, hand warmers in your sleeping bag can be a big help, the same company also makes sock liners. I have used these in power outages. Battery powered heated jackets, socks and gloves can be a huge help as well. You can also set up a small heater - you want to check the wattage and if it has temperature control, or a portable AC (make sure your tent is big enough. If it’s your first time around the block, read the dimensions carefully, they run small). It's safer to place the heater up on a small table or round of wood to keep it from knocking over or blowing directly onto something that could melt or burn, make sure the tent is big enough to accommodate a heater with lots of space around it and it has an auto shut off when it falls over. I use this little heater because it's super low wattage. For the AC you will need to cut a hole for the exhaust and seal around it. If my tent is on the ground and I have a thick Thermarest I can be warm enough with a heated blanket and that little heater down to 5C. I don't sleep well when I'm cold, but everyone is different so you will have to work out those details. Some people do use wood stoves in a tent. I'm getting this one for the cargo trailer but I do not have experience setting up a wood stove in a tent. Use heaters, heating blankets or woodstoves at your own risk of fire or electrocution. They are not recommended for tents. - Non-cotton fast drying travel towel, I use this one. - Eye mask and ear plugs, and for really loud situations the "triple down" method of (foam + silicone + ear protectors (or noise cancelling headphones). The foam contoured eye masks smell and need some time to offgas, the fabric ones can be offgassed by washing. I always keep a backup mask. The construction ear protectors do smell quite strong. One benefit of noise cancelling headphones is some noises cannot be blocked without adding white noise. -Hand sanitizer and baby wipes are essential in a tent (unscented of course, for youself and also if there are bears around). To avoid flame retardants you may consider the Moonlight tent or Sierra Tensegrity. Some of the canvas tents do not have flame retardants. For sleeping mats, none of the Thermarest mats have FRs. Wildkin sleeping mats and sleeping bags are also FR free. Two other sleeping bags that are FR free are Holy Lamb Organics (but they use cotton), and Kelty. Thank you to Emily Snelling for content support and the members of Mold Avoiders on the Road for all the advice along the way. If you are going to purchase any of the items listed here and if you found my site’s content useful, please consider purchasing through my links - it will not cost you any more. Exped mats are nice, insulted mats that REI sells. Verified they do not have flame retardants on them at all. They have down insulation and work great to keep you warmer. Also Kelty sleeping bags are flame retardant free as are Big Agnes. Other brands may be as well but I'm not sure. For some reason Polyester is better for me than nylon so I go with bags lined with that Kelty. though I also have a REI brand one that seems to be fine as well. (Haven't heard about the flame retardants on that one though. We go with a big agnes tent (only for camping not living) and it's great, though they still do have flame retardants. If you buy a Nemo tent from Colorado they will be Flame R free I read on their website. Thanks! Some of the exped mats have polyurethane, which works well for me after about a week, but would take a while to offgas for someone super sensitive. yes Exped is the one I use! Did take a little time to off gas, maybe a week or so, but have been using it for about a year and works great for me! (Big MCS sufferer here) :) Good to know about the Kelty bags since that's one of the ones I've been using for a long time and I also use another REI brand that seems ok. I'm also very reactive to flame retardants, so I was happy to find this site and the links for different tent options. Thank you! There is a WAY better way to go. I have invented a complete line of organic natural fiber camping gear at www.lucky-sheep.com I use organic cotton and eco wool as the insulation. Also have wool sleeping mat and organic cotton tent with beeswax coating. Do yourself a favor and ditch the plastic! There is no way I would use cotton in my camping gear that will mould up fast. I wouldn't use wool either personally. I'm on my 2nd handmade canvas tent, this time coated with hemp oil and a hemp oil tarp over, silicone on the seams and under the bottom, and on a tent platform. Used it for a few months then we got our seasonal heavy rains (southern Arizona, never though combating molds would be so hard, but we get the really tough molds, as soon as there is any moisture they go to town! ), and after a few rains mildew started up at the corners and some water got inside on the bottom and now there are a lot of dark grey streaks. So will probably try one of your tent recommendations next! But in the meantime winter is coming and it gets down to 20s at night. I did a stove in my last canvas tent but had a lot of trouble with temp control and getting cold in the night when it went out and ash and smoke mess, etc. So this winter we were thinking of trying an A frame sleep structure from plywood which has now off gassed for half a year and I don't smell it now and some rigid foam insulation. We heard the insulation could be used on the outside as rain protection and we could silicone the cracks. But I don't know if foam right up against the plywood would cause any moisture and mold issues. I just need something to sleep in. Been sleeping outdoors a few years now because of MCS and EHS, house isn't tolerable enough for good sleep and I sleep really far from the house. But the rain in summer and cold in winter have made this all very challenging because my tents keep getting mold! So I found your site, thanks for all the great info. Just wondering if you know anything about making a small sturdy insulated sleep structure. Oh and btw, I also heat rocks on the kitchen stove, put them in cozies I made and put them in my sleeping bag at night, very helpful! But still need more insulation for those really chilly nights. Thank you! You could look up the exterior insulation with foam method to see how much you need to not cause dew point in the walls in winter. If you don't use AC in the summer you could put the foam on the inside. This project needs some thought to it though as neither plywood nor foam can brave the elements on their own. I suppose it depends how long you want it to last. Plywood, OSB, and luan mold easily, sometimes you have to pull the sheeting apart to see it. Wood tongue and groove or overlapped would be better. If the lumber is clean, you can use linseed oil to seal it, it has to be the pure linseed oil from Europe or similar, check the msds. If you go with your current idea, keep an air gap of a few inches between all the materials and make sure you can monitor it. The air gap also keeps you warmer. If you tolerate reflectix, use under the sleeping bag. And insulation. If urgent, use a blue tarp exterior, then reflectix air gapped like interior tent... no flame inside this. Thermarest sleeping mats are treated with flame retardants... did something change since this article was written?? That's not what I heard from the company. Where did you see they are treated with FR?